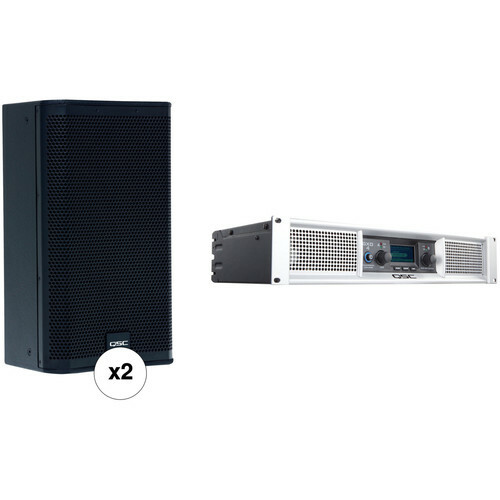 The QSC E110 System is a kit that combines two QSC E110 10" two-way passive loudspeakers with a GXD4 professional 1600W power amplifier to create a turnkey PA with integrated DSP processing for a professional-quality live sound and music playback system. The black QSC E110 is a compact, two-way loudspeaker with a 10” die cast frame woofer with a 2.5” voice-coil, housed in a multi-purpose enclosure for stage monitor or main PA deployment. It incorporates QSC DMT (Directivity Matched Transition) design with an 85° wide coverage. When used as a stage monitor, the E110 loudspeaker is angled up at 55°, allowing it to be placed near the performer when used on a crowded stage. An all metal, dual angle, 35mm socket allows the loudspeaker to be mounted vertically on a pole or angled down by 10° to improve audience coverage and reduce rear wall reflections. Multiple mounting options using E-Series Yoke or M8 eyebolts (sold separately) are supported. Input connections include dual NL4 as well as screw terminal receptacles. Like all speakers in the E-Series Entertainment System, the E110 is compatible with GXD, PLD amplifiers and TouchMix digital mixers, which afford advanced signal processing options to help fine-tune the performance of your speakers. The QSC E110 features a redesigned yoke for better mounting in permanent installations. The GXD 4 from QSC is a power amplifier designed for professional PA systems utilizing speakers with 4 and 8 ohm loads and a maximum output of 1600W. The GXD 4 employs a class D output stage with a universal power supply for high performance and efficiency, while keeping the unit lightweight at 11.3 lbs. The integrated DSP section includes High and Low-Pass filters (24dB LR), 4-band parametric equalizer, signal alignment delay, and RMS/Peak speaker protection limiting. The parallel XLR and 1/4" TRS input connectors offer broad compatibility with convenient loop-through capabilities, while the professional binding posts and NL4 connector provide mono and bi-amped speaker connections. In addition to the limiting offered on inputs and outputs, the GXD employs smart speaker protection by providing settings for the loudspeaker's continuous output and impedance (4 ohm or 8 ohm). The GXD 4 ships with a standard IEC power cord. Box Dimensions (LxWxH) 26.2 x 17.0 x 16.8"
Box Dimensions (LxWxH) 23.5 x 14.3 x 6.4"